Brisbane is well served by direct international flights to major transport hubs in the Middle East, Asia and North America, with onward connections to Europe. Brisbane is also well served by connections to major domestic airports in Australia. Brisbane airport is approximately 12km from the city centre. Taxi: Taxi ranks are available outside both the international and domestic terminals. Airtrain to Central Station, $28 return if booked online. Central Station is an 8 min walk to the hotel. 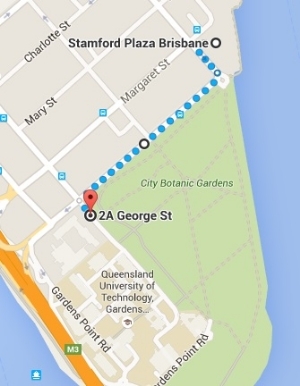 The Stamford Plaza hotel is an approximate 5 minute walk to the Queensland University of Technology (QUT) campus, where the GOBLET workshop and AGM will take place.